Part of the added fun of having a bit of outdoor space where we can enjoy our gardening experiments is that we often have unexpected “visitors” who drop by to tour the grounds and evaluate the fruits of our humble estate. But come to think of it, the grounds that we now occupy actually belonged to the wildlife long before we got here. So, technically, we’re actually “visitors” to them. 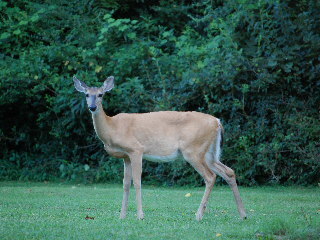 Which brings me to the conclusion that we need to peacefully co-exist with the wildlife as neighbors and land-sharers! The white-tailed deer seem to be the original and rightful owners of our little piece of the globe (they're plentiful here), so we need to honor their rights and accept the fact that when they enter our backyard they're also entering their backyard--and they’re here for the buffet! And if we don’t want their lunch to be our tender petunias, we need to find a way to make our cultivated crops unappealing to their taste buds--while at the same time, not harming these beautiful animals. Our friend, Ed, has come up with an easy-to-make and inexpensive deer repellant that you can mix and then spray onto the plants that you don’t want to have eaten by the animals. The recipe consists of two eggs emulsified in the kitchen blender, to which you add some milk and detergent, and then enough water to fill a gallon jug. Set the jug outdoors in the warm sunshine for a few days/weeks to allow the concoction to attain full potency. According to Ed, after spraying onto your desirable plants, the repellant soon loses its rotten egg odor to humans but remains effective in deterring the deer. You will need to reapply after heavy rains wash the plants free of the mixture. Harmless to the environment, the wildlife, and the property owner--and inexpensive to create! If you check the labels on the deer repellant products at your garden center, you’ll find that many of these contain ingredients similar to our homemade one (egg solids, etc.). However, the store-bought products cost anywhere from $12 to $25 depending on size and brand name, while a gallon of “Ed’s Really Good Deer Repellant” costs less than 50 cents to make at home! Sooooo, gardening friends and music lovers--it’s time to get out your banjo, guitar, or autoharp. And sing a verse or two of that great old Bluegrass song “Live And Let Live”, while you appreciate the fact that your deer friends from the wild can stop by and enjoy the music too, as they nibble a little snack in the backyard--without eating up your (now-protected) petunias, pansies, and posies. Just remember to hold the volume of your music down a bit so you don’t scare off those beautiful white-tails--that’s not the kind of deer repellant we want!